The Jan B. 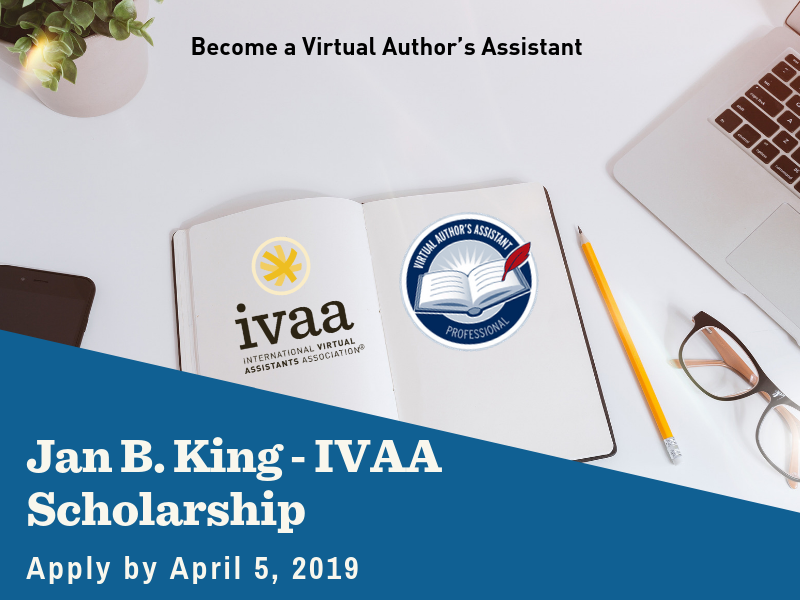 King IVAA Memorial Scholarship for Author’s Assistants. This scholarship is in memory of the late Jan B. King, founder of the Professional Author’s Assistant Training Program. Jan was a long time supporter of IVAA and a leader in the industry having created her training program for Author’s Assistants in 2007. She helped many Virtual Assistants create a specialty and niche, which led to success for many Virtual Assistants all over the world. Jan passed away in 2015 after a fight with cancer. IVAA is honored to partner with Janica Smith and Michelle Scappace, former students of Jan’s and the new owners of the Professional Author’s Assistant Training Program, to offer the Jan B. King IVAA Memorial Scholarship for Author’s Assistants. The recipient of the Scholarship will be announced at the Live Summit in May at the Live Summit along with IVAA’s other awards. 1. Free registration to the Author’s Assistant training valued at $799. 2. Free 1 year membership to IVAA valued at $137 (or 1 year extension if current member). 3. Free registration to IVAA’s Online Summit valued at $97. Applications will be accepted until April 5, 2019. Applications will be reviewed by two members of the IVAA Board along with Janica Smith and Michelle Scappace. All IVAA members eligible except those doing application review. This award is also open to Non IVAA members. ** Please remember to submit ALL items with your application.